If it could be said that a movie, like a person, possesses a "flat" or "blunted affect," it would be said about 90 Minutes in Heaven. Irony of ironies, I left this movie feeling depressed. Worn out and worn down. Abraded to the nub. Hayden Christensen is a boring and sad sack, and his wife, portrayed here by Kate Bosworth, is no better. Gosh, what a squandering of talent. They shuffle aimlessly through the movie as if lobotomized or tranquilized, drowning in a sea of gray. So much of the movie is tone deaf, as far from pitch perfect as one could imagine: post-accident scenes in the hospital waiting room, a room that would realistically be overflowing with praying congregants is, instead, completely empty, devoid of life as if the film could not afford actors or extras. The traumatized and abandoned Piper family, which apparently subsists now on McDonald's drive-thru alone would, instead, be drowning in a daisy chain of meals provided by friends and family who never arrive. Scenes that should be uplifting and hopeful are, instead, sour and dour and dark. It is simply flat, flat, flat. 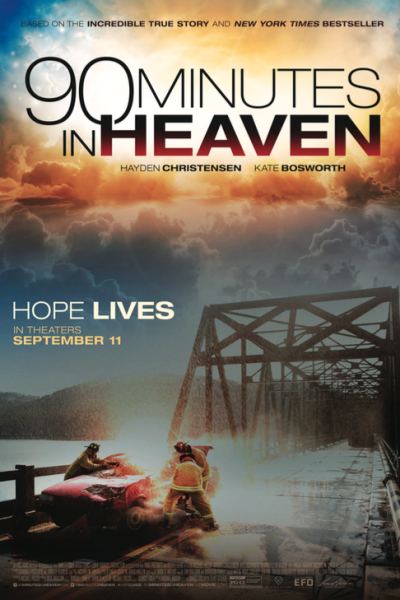 And the title, the premise itself, 90 Minutes in Heaven, is altogether misleading. There is only fleeting reference, on perhaps three sketchy occasions, to Pastor Don Piper's professed moments in heaven. The film, clocking in at a laborious 121 minutes, is 119 minutes of everything but heaven. A more apt title would have been 119 Minutes of Surgery, Self-Pity, Long-Suffering Existence and Aggrandizement in Three Hospitals. Pastor Piper was certainly courageous, and 105 days in the hospital is a terribly long time, but the tale feels disproportional, much ado about nothing terminal. By no means do I minimize or marginalize it, so much as contrast it with films that do a serviceable job of driving the experience home. Here, what we have is arm, pelvis and leg injuries that require 34 surgeries to resolve, which is so unfathomable that it is, admittedly, impossible to process or appreciate. But it is the film's responsibility to make us appreciate, or to create sufficient emotion so that, when the time does come to celebrate and revel, we wish to do so. Instead, I simply felt nothing. And that, given the subject matter at hand, seems negligent if not borderline criminal. Born on the Fourth of July, The English Patient, Awakenings, Lorenzo's Oil...there are countless films that do a wonderful, albeit sobering job of capturing and portraying the depression that accompanies protracted hospital stays and states of bedriddenness, pockmarked as it is by isolation, loneliness, emotional withdrawal, detachment, anger, fear, agony, pain, bitterness, helplessness, hopelessness, even guilt and embarrassment and the like. But this film does little to communicate these effectively; Christensen failing miserably to stimulate our empathy gland in any way whatsoever. Instead, he mechanically portrays a man in a car accident, who then endures a period of blue and routine self-isolation, who eventually articulates his interior life with only a monosyllabic and glancing description that attempts cryptically and treacly to tidy up the movie's massive loose ends in the choppiest of rushed closing moments. Anyhoo, I could go on and on, as the film does, but I'll choose instead to simply leave it at that, and move on. My advice would be you do the same.